My Word is a seed, says the LORD. 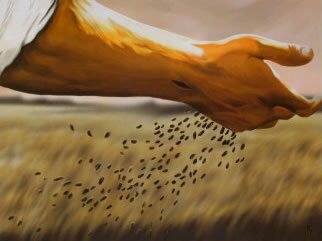 I give seed to the sower, and bread for your food. You can trust that My Word is the bread of life, for I AM the living WORD. My seed is in you, and you are My offspring! What I do for you is LIFE GIVING, always. My Spirit is LIVE in you! It is a well-spring. What I do in the realm of the SPIRIT will be superior to the natural, for it is by My Spirit that all things are done. As you have life in My Spirit, bread of life in My Spirit and Eternal Word, will I not give you what you need in for your earthly sojourn? For what is eternal also contains that which is for time, and as you seek My kingdom and My righteousness that remains forever, what you need for your daily life will be supplied, says the Lord. The seed of My Word must be planted. As you hear My Word, then plant it as a seed. The more you plant, the greater your faith will be, and the harvest will come. For faith in Me, is faith in My Word. I HAVE GIVEN YOU THE SEED OF FAITH, to plant. According to what you do with My Word of faith, will be the result of the harvest of your faith in My eternal Word, that is unfailing. For there will always be a harvest, and the bounty is up to you, says the Lord. For as you sow My Word, I will give you more, says the LORD. For My understanding is infinite. I will give you increased wisdom and knowledge and understanding, so that you can PLANT IT! That will bring a harvest, according to what you plant! The harvest of the good seed of My Word is coming for all who will use the seeds that I have given them. They are LIFE in you. They are eternal! My Word is infallible, and My Word and My Will and My Work are in complete agreement, and you will see the greater works, as you plant the seed of My Word, and continue to sow it bountifully, so that you can reap bountifully, says the LORD.